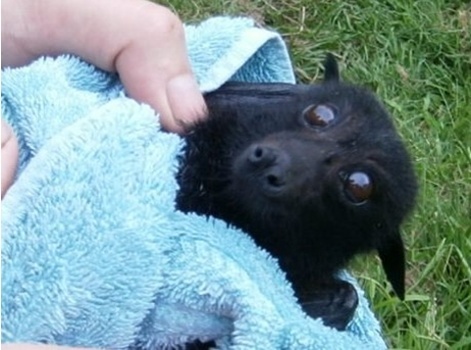 Cherokee was the first case experienced by BatsQLD members. 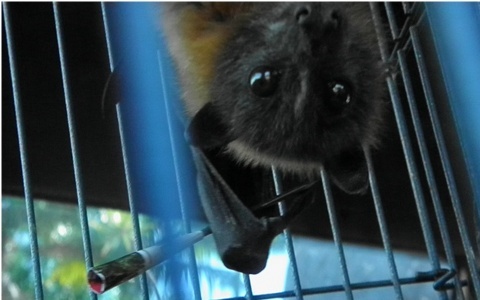 After a receiving a regular rescue call of a bat hanging alone in a tree Christine arrived on site to see a juvenile Grey Headed flying fox with 100mm blow dart though her right radius. Christine then took a few pictures for evidence and then straight off to the vet to see what they could do. 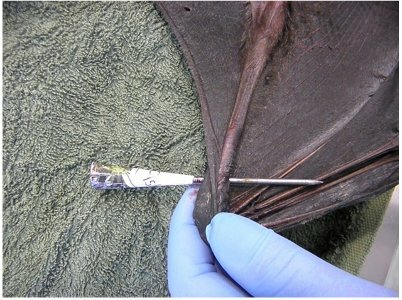 Once under anaesthetic it became apparent that several attempts had been made to shoot Cherokee as there were matching holes in her membrane as well as the dart lodged in her forearm. Fortunately the dart had hit the bone far enough away from the joint to allow our vet to pin Cherokee’s arm so a full recovery was possible and Cherokee was released after several months of rehab. DERM, RSPCA and the police were contacted which resulted in some men from a nearby unit being questioned but as far as we know nobody was charged. Peter Sterling was again found hanging low in a tree in a suburban back yard. Mary and John were on site soon after the call to find Peter hanging with one wing hanging down and not looking well at all. When Mary and John arrived at the vet they noticed that Peter was covered in dried blood and was contorted as if one side of his body was in spasm. Our vet had only return from a seminar on gunshot trauma and the treatment of animals the day before. Little did he know at the time that he was about to apply his newly gained knowledge on Peter. Once he had x-rayed Peter he could see a pellet lodged in his left shoulder very close to the brachial plexus nerve. 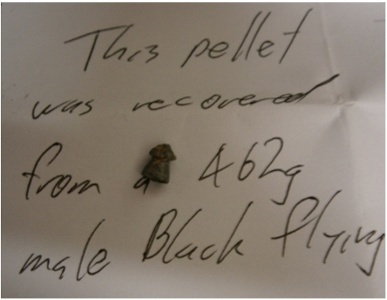 The pellet was removed but Peter was barely conscious and in a bad way. After some intensive care Peter eventually did get over the initial injuries but unfortunately has suffered some nerve damage which is he may not recover from although he shows continual improvement. Yet again nobody was found responsible for injuring Peter.